Assagioli summarized his view of the human psychological constitution in the following diagram which has come to be called the “egg diagram”. The area within the central circle is the field of consciousness, at the center of which is the “I” or personal self. The “I” is the point of pure awareness and will which is the subject of our field of consciousness and the integrating center of our personality. We can realize what is meant by the “I” if we step back to that place within us from which we can register and observe the various aspects of our experience. We can become aware, for example, that we are experiencing various sensations in our body, and that these sensations—the content of consciousness—are something different from the source or subject of consciousness. These sensations are constantly changing; they may be pleasant one moment and unpleasant the next. The observer, however—the one who is aware—remains the same. We can experience a center of stable identity within us which does not fluctuate with the changing contents of consciousness, with our momentary and transient experiences. Just as we can register awareness of our physical experiences, so we can register awareness of emotional and mental experience. If we observe our emotional states, we will realize that these too are constantly changing. One moment we are happy, the next moment we are sad. We may experience fear, anger, love, and joy all within the same day, but our center of identity, the Observer of these experiences, remains the same. In a similar way, we can observe the endless sequence of thoughts and images that flow by in our mind stream. Our mental life is full of movement; the mind finds it difficult to stand still for even a minute. Yet the “I” consciousness that underlies these experiences, remains the same. Like the projection screen on which a film plays, it provides us with a sense of permanence and stability in spite of the fact that the contents of our consciousness are ceaselessly in flux. 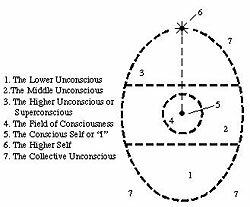 Returning to the “egg diagram”, it can be seen that the “I” or personal self is connected by a dotted line to a point above it—the higher or transpersonal Self. This transpersonal. Self, like the personal self, is a center of consciousness and of will with the difference that its domain is more inclusive. The transpersonal Self is able to extend its awareness to include the whole realm of the personal unconscious as well as the more limited field of consciousness. It is the center around which integration takes place at the stage of the transpersonal or spiritual psychosynthesis. Many people have had no direct conscious experience of their transpersonal Self, as this is something that generally comes in the more advanced stages of inner evolution. Assagioli’s inference of the existence of the transpersonal Self is based on the testimony of those who have experienced it. Reports have been given by the mystics who speak of a blissful, unitive experience of pure Being in which all polarities and contradictions seem to be resolved and which has a powerful integrating effect upon the personality (Bucke, 1923). Other persons who have practiced various psychological techniques such as mental imagery or meditation have reported similar experiences. We can also surmise the existence of a deeper center of identity within ourselves from the fact that the conscious “I” may disappear, as in sleep or under anesthesia, without causing us to loose the sense of continuity of our existence. It is a very remarkable thing that the Ucs. [unconscious] of one human being can react upon that of another, without passing through the Cs [conscious]. The surprise in Freud’s statement is an expression of the zeitgeist of his time: his conception of the relationship both between body and mind as well as between patient and doctor was steeped in 19th century Cartesian, positivistic paradigms. Since the 1930’s Reich has helped us deconstruct the mind-over-body bias in ways which are being confirmed by modern neuroscience (Damasio 1994, Schore 1994, 2003). And since the ‘countertransference revolution’ of the 1950’s (Samuels 1993: Chapter 2), modern psychoanalysis has come to appreciate the patient’s and therapist’s inner worlds as enmeshed and interwoven to a degree which radically deconstructs traditional assumptions regarding the therapist’s role and function (Mitchell 2002, Samuels 1993). A further recent development is the notion of ‘parallel process’ (Hawkins & Shohet 2000, Searles 1999): not only can one person’s unconscious communicate itself to the other person in the room, but the relationship dynamic between client and therapist can unconsciously be re-enacted in another relationship, i.e. between therapist and supervisor. The body psychotherapy tradition has a refined body/mind understanding of transference (Reich 1972; Leites 1976; Mindell 1982; Conger 1994; Johnson 1994; Totton 2003). Modern psychoanalysis (including relational, intersubjective, object relations and self psychology approaches) has a refined relational understanding of countertransference (Heiman 1950; Langs 1981; Greenberg and Mitchell 1983; Mitchell and Aron 1999). These traditions have grown out of classical psychoanalysis, and a (re-)integration of their theoretical frameworks may generate an holistic phenomenology of relationship (Boadella 1987, Fairbairn 1958, Lowen 1958, Schwartz-Salant 1998, Winnicott 1971) see Fig. 1. I will attempt to bring the two traditions together, without minimising their contradictions or reducing one to the other, by formulating both transference and countertransference, internal and external relationships in body/mind terms as parallel process. I will propose several fairly large-scale extensions to the established notion of ‘parallel process’, with relational dynamics being embodied and reflected on different levels intra-psychically and enacted interpersonally. This model allows us to consider ’embodied countertransference’ as a cornerstone of an holistic, integral (Wilber 2000), relational framework which sees the therapeutic relationship as an intersubjective, culturally contextualised system of complex parallel body/mind processes. To make this abstract framework applicable and practical, I will focus on the therapist’s stream-of-consciousness in relation to that system. As within any system, spontaneous processes of self-organisation (Maturana & Varela 1980) are always already occurring: we can attend to the body/mind phenomenology of the integrations and dis-integrations, the transformations and repetitive patterns of the system itself and the two people within it who are both wounded and whole. As body psychotherapists, we think of ‘internal process’ in body/mind terms, along a spectrum comprising body-emotion-image-mind-spirit (for a detailed list of body/mind processes along this spectrum, see Soth 2004). One term in use in the body psychotherapy tradition (Boadella 1987, Kepner 1987, Eiden 2002) which nicely captures the energetic and process quality of the interaction (rather than the verbal and content aspects) is ‘charge’. We can think about charge in terms of three kinds of contact which reflect how transference and countertransference are mutually linked via parallel process. The ‘quality of relating’ implicit in these kinds of contact also constitutes three kinds of ‘working alliance’. I mean not only the working alliance as a bond between the ‘adult, healthy ego’ of the client and therapist (Clarkson 1995): this rather static notion becomes questionable when we see the ego itself reflecting internalised object relations. I am complementing this with a more fluid, dynamic notion of an alliance with the client’s (partially unconscious) ‘spontaneous process’. This will become clearer as we proceed. 1) unambiguous: the therapist has no concerns about the working alliance, as it is currently taken for granted. The transference is not constellated, active or in the foreground – the client is unambiguously using the therapist in role, or relating to the therapist as a person. 2) ambiguous: the therapist has a sense of the working alliance as ambivalent. The transference reality has entered the room, is constellated and active, but kept in check by, balanced by, or existing side by side with the ego-ego working alliance. This kind of contact is a confusing mix, full of double messages, which eventually affect the therapist via projective identification. This, in turn, often leads to apparent mis-attunement and miscommunication. In relation to the client’s character conflict, the therapist is in an impossible position: having conceptualised the internalised aspects of character as the conflicted ego in conflict with a spontaneous conflict, whose ‘side’ does the therapist take: the side of the ego or the side of the spontaneous conflict? The ego’s overall aim, in relation to the spontaneous experience of the wound, is to keep it at bay and to maintain, if not improve, the status quo. The pressure from inside, whether we conceptualise this as the re-emergence of the wound which is hoping for resolution, or in Jungian terms along the ego-self axis as the impulse towards individuation, is opposed to the status quo. It is impossible for a therapist to follow a strategy of overcoming a dysfunctional pattern without enacting in the transference the person in relation to whom the pattern originated. When all the fragments of the conflict inherent in the re-enactment can be held in sufficient awareness across the levels of body-emotion-image-mind in the relationship in the ‘here and now’, the conflict will tend to re-organise itself. By empathising and identifying with split and opposed objects, which are manifest in the client as a conflicted ego in conflict with a spontaneous conflict, the therapist ends up internalising the client’s body/mind split and its implicit object relational dynamics. I have tried to show that by integrating the body/mind sensitivities of the body psychotherapy tradition and the relational sensibilities of modern psychoanalysis we can arrive at an embodied notion of countertransference. Making use of the full body/mind complexity of ’embodied countertransference’ relies on the recognition that the therapist’s experience is necessarily conflicted, torn between polarities, and that the therapist’s conflict – both as a person and as a professional – frequently reflects the client’s inner world as a parallel process. The therapist’s subjective body/mind process therefore contains information about the ‘other’. If the therapist can surrender to this, the spontaneous, self-organising processes occurring within the therapist’s body/mind constitute the construction and de-construction of the therapist as an object by the client’s unconscious. The therapist is forever drawn into uncontained and uncontainable re-enactments which require re-organisation and transformation of both people involved in order to stand a chance of eventually being contained. ‘Containment’ and ‘working alliance’ are paradoxical notions: they need to break down in order for them to exist. The therapist’s surrender to the constellated re-enactment is facilitated by a differentiated and attuned awareness to the multiple parallel processes resonating throughout the therapeutic relationship and the body/mind of both people involved. The therapist needs to be aware both of the overall relational pattern and of the specific and subtle spontaneous body/mind detail of ’emergent process’. I have considered countertransference as embodied in contrast to the historically developed notion of countertransference – a meta-psychological context which has a good portion of disembodiment structured into it. But the systemic, parallel process view I have proposed here goes beyond the issue of embodiment. My hunch would be that in a couple of decades we will have moved beyond the 19th century embodiment / disembodiment juncture into an integral-systemic-parallel process view of what I would call the ‘fractal self’. Psychosynthesis is known worldwide as ‘the psychology with a Soul’. It is a holistic approach and includes an exploration of the biological, emotional, psychological, social, sexual, cultural, ecological and spiritual elements and influences on health and well-being. Spirituality in a psychosynthesis context is often used to describe the deeper essence of who we are, the innate part of us that continuously calls us towards growth and wholeness. When we are present to this deeper essence, it provides us with a sense of belonging, connectedness, value, meaning and purpose in life (Gale 2010). Roberto Assagioli, the founder of psychosynthesis, was a colleague of both Freud and Jung. He was a psychiatrist, a neurologist and a pioneer of psychoanalysis in Italy. Ahead of the times, he gradually moved towards a more inclusive and mindful approach to human development. Assagioli was interested in the soul, the esoteric, yoga, spirituality and religious teachings such as Buddhism, Christianity and Jewish mysticism; these deeply influenced his map of the human psyche. Assagioli’s work has been widely influential in the fields of humanistic and transpersonal-based psychologies. Psychosynthesis practitioners have been using Buddhist mindfulness theory and techniques for at least half a century, many of which are being used in popular mindfulness and acceptance based psychologies today. Psychosynthesis integrates the best of western psychology, eastern and western spiritual disciplines. Psychosynthesis theory and practice is in a constant process of evolution and growth as rigorously trained practitioners worldwide integrate new philosophies, ideas and evidence based practice – such as neuroscience – into their theory and practice. Many psychological approaches focus on only part of who we are, for example, our thinking. Assagioli’s model is still at the cutting edge of psychology today due to its inclusive nature and because it takes into consideration the whole of the psyche and the whole person (Gale 2010). Psychosynthesis provides an approach to life, personal development, counselling, coaching and psychotherapy which incorporates working with early childhood and past trauma, current issues in the here and now and the vast potential for growth, healing and change. In a recent research program whereby I participated as one of the therapists, neuro-psychosynthesis practitioner Dr Stratford shows that the therapeutic relationship between the therapist and the client is essential to healing. Relationship lies at the heart of psychosynthesis therapy.